Way back in September, we started Clean Eating as a family. 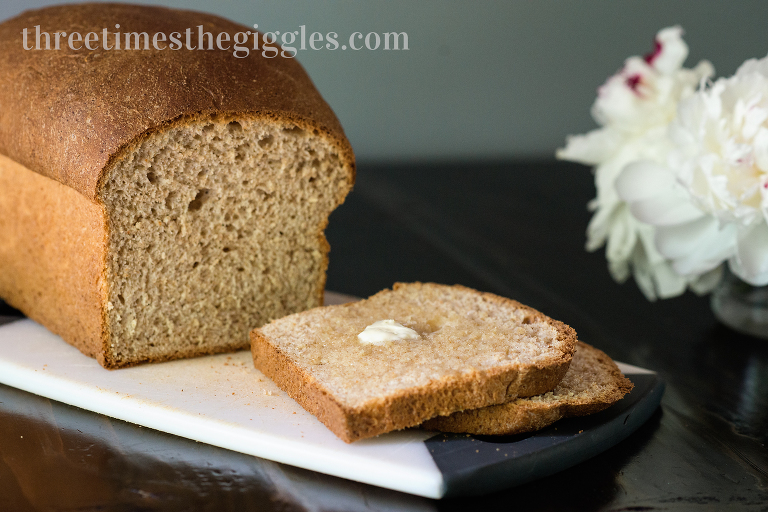 Clean Eating meant I either needed to start spending a small fortune on bread (because have you ever studied the ingredients in your favorite bread?) or I needed to start making it myself. Guess what this budget savvy girl decided to do? Turns out it’s quite easy to make, but also really easy to mess up! I spent months struggling with bread. Seriously. Months. I posted about it on the blog here once, looking for help, and got all sorts of advice. Some of that was quite helpful in my bread-making journey! Usually I could get the bread to do one rise, and the second rise and then it would collapse as soon as it started baking. Other times it wouldn’t really rise at all. The bread still tasted great, thankfully, so it wasn’t all wasted ingredients and time! The whole process was extremely frustrating though. A couple of months ago, I finally conquered the bread issues! 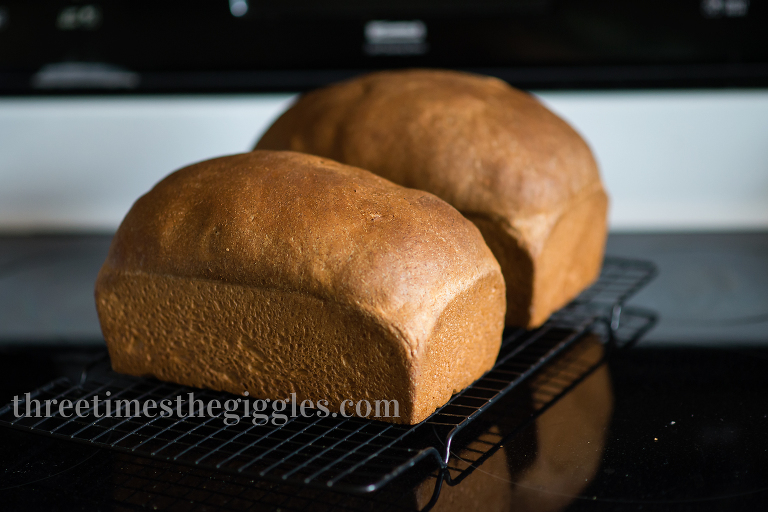 I bake a couple of loaves every 3 or 4 days here (depending on how many slices I eat when it comes right out of the oven – ha! ), and I have a pretty great success rate now. I’ve had several friends ask me for my recipe, and I’m happy to share it with you all today! Disclaimer – bread is finicky stuff! While this method works in my kitchen, it might not work exactly right in yours. Tweak it until you find what does! And all that being said, little mistakes like letting it rise too long, or kneading it not quite long enough can cause the bread to collapse – be diligent! 1. Dissolve 1 tbs of brown sugar in the 2 cups of warm water. Then stir in the 4.5 tsp of yeast and let sit for about 5 minutes. The yeast should start to grow and crown on top of the water. 2. In a bowl (I use my KitchenAid) combine the whole wheat flour, vital wheat gluten, salt and 1/4 cup brown sugar. Turn the mixer to stir (using the bread hook) and slowly add in the 1/3 cup of oil, followed by the yeast/water mixture. Once it’s mixed (and it will look very wet, most likely), turn the mixer off and let it sit for 20 minutes. 3. Turn your mixer back on to the “stir” setting and mix in bread flour, half a cup at a time. You’ll likely need the full 2 cups, but sometimes I only need 1.5 cups of it. You’ll know you have just enough when the sides of the bowl are almost completely clean, and your fingers don’t really stick to the dough when you touch it. Let it kneed for another 2-3 minutes now. 4. Turn your oven on to 400 degrees and set the timer for 1 minute. As soon as the timer goes off, turn the oven off! You’ve now nicely warmed the rising spot! 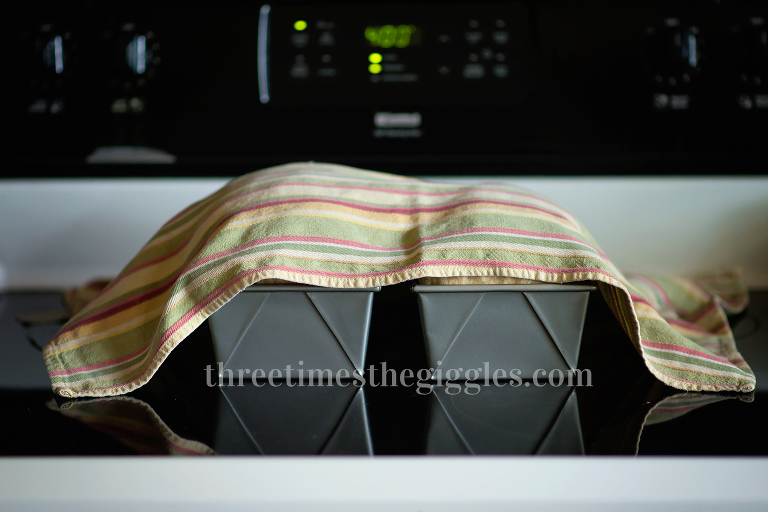 Stick a small bowl of warm water on the bottom rack, and turn on the oven light. 5. Take your dough out of the bowl and divide it into two balls. Roll the balls into more of an oblong shape and drop each one into a greased loaf pan. Cover the pans with a towel and stick them in the oven to rise. Clearly I didn’t divide the dough evenly this time! 6. After about an hour, your bread should look like the picture above – nice and high! Take it out of the oven, along with the bowl of water, and preheat the oven to 400 degrees. 7. Once the oven is preheated, carefully remove the towel (and you’ll now really know if you didn’t have enough flour – the towel should not stick to the bread if there was enough flour added!). Put the pans in the oven, and set the timer for 15 minutes. Tip: If you really like a crunchier crust, throw in an ice cube at the same time. The steam will help form a crust on your crust! 8. When the timer goes off, lower the temperature to 375 degrees and bake for 22 minutes more. When the time is up, remove the bread from the pans immediately, and let them cool on a wire rack.